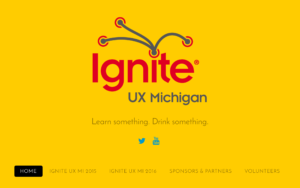 I am the co-founder and continue to be co-chair of Ignite UX Michigan. Although it is an example of one of my professional volunteer activities, it is a perfect example of product management and exercising leadership. In my role as co-chair, I manage relationships with sponsors, venues, and partnering organizations. I coordinate volunteer assignments and am accountable for ensuring they have the resources they need to do a good job.This role brings with it a healthy dose of project planning—keeping track of the “nuts and bolts” of making sure everything happens at the right time. Lastly, my co-chair role has given me the opportunity to lay out a vision and strategy for a product. The vision for the event came first. In 2013, I proposed a vision for the event to the person that would become the other co-founder: a free event consisting of a series of short talks that would promote diversity in the user experience community. We set about making this vision a reality. 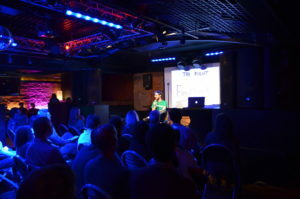 Since then, as co-chair, I have been responsible for laying out a strategy for organizing the first event, and then growing Ignite UX Michigan in subsequent years. For the first year, we emphasized planning what was, essentially, a minimum viable event. We raised just enough money to secure a venue, borrowed resources from other organizations such as web hosting and email lists, and, as co-chairs, did most of the work of putting on the event. For that first year, we wanted to find out if people would propose talks, sponsor, and attend the event. It turned out that the event was viable. In subsequent years, the event has grown in size and become more easily repeatable as we built up processes and workflows. Each year, we have picked one or two goals to focus on, such as formalizing volunteer roles, moving to a new venue, adopted a code of conduct, and so on. It is important that we improve the event every time, but that we do not take on more than we can handle. Ignite UX Michigan has been a great opportunity to try my hand at managing a product and to gain more experience managing people and planning a complex project.